Many employees have their doubts about corporate flu shots simply because they are misinformed. There have been many false accusations about influenza and the flu vaccine throughout the years. Anyone can hop online and find a “resource” to support a specific argument. Unfortunately, those resources aren’t always credible – which lends to the mass amount of misinformation about the flu shot. The popular myth that “the flu shot gives you the flu” might be holding some of your employees back from receiving their vaccine. It’s important to let your employees know that this simply isn’t true. The vaccine is made from either an inactivated flu virus (meaning the viruses are no longer infectious) or from proteins that don’t contain the virus at all. While the flu shot can sometimes cause minor side effects such as a low-grade fever, nausea, and muscle aches, there is no way that the components of the flu shot can infect someone who receives it. Your employees might also be misinformed about the safety and effectiveness of the flu shot. For example, one common myth links the flu shot to disorders such as autism. Science has repeatedly shown that this is not true. Others might believe that the flu shot simply doesn’t work. However, healthcare experts recommend the flu shot time and time again as the single best way to protect yourself from influenza. Unfortunately, no matter how much correct information is spread about the importance of the flu shot, there will always be false accusations just a click away. That misinformation can have people confused and complacent throughout flu season – which is why employers should be aware of these common myths and misconceptions about the flu shot. It’s essential to properly educate employees about getting vaccinated over flu season! There are many different types of bugs and illnesses that spread during the fall and winter seasons and make you feel sick. But not all of those are the flu. Many people use the word “flu” as a generic term for a general illness when, in reality, it’s a serious and specific illness. The influenza virus causes the flu. While influenza is a specific virus, there are many different types (or strains) of the flu. What makes influenza stand out from other illnesses is its high attack rates and the severity of the illness. The flu spreads like wildfire every fall and winter. It’s easily passed from one person to the next. People tend to feel sick very suddenly because it hits much more quickly than the common cold. The flu will also likely put you out of commission for several days – maybe even up to a couple of weeks! When employees assume any cold or 24-hour bug is the flu, they start to believe it’s really not that bad and that they’ll be fine without a flu shot. They deny and underestimate just how serious the flu can be. If employees don’t understand the serious risks of the flu, they’ll think they’re better off just taking their chances. Employers need to address the severity of the flu and the negative consequences it can have on employee health and productivity. When it comes to the influenza virus itself, the only thing scientists can predict is that it’s unpredictable. Influenza can change and mutate each year, which makes it difficult to predict the severity and timeline of each flu season. Naturally, that has contributed to a skeptical public. Looking back on previous flu seasons, we’ve witnessed sudden, unforeseen flu outbreaks. We’ve also heard serious warnings from healthcare professionals about severe flu seasons that never panned out. It’s natural that these things happen because the virus is so unpredictable. However, some people might incorrectly view these inaccurate flu season predictions as scientific mistakes – which can make it difficult for your employees to trust the experts when it comes to flu prevention. So, what do all of these common obstacles of flu season have in common? Misunderstanding. The good news is that all of these common obstacles can be overcome by proper communication and education. We can’t stress enough how important communication and education are to your workforce during flu season! Start communicating with your employees before flu season hits and keep educating employees throughout the season. 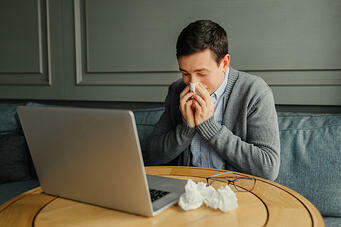 Without an effective communication plan in place, many of your employees will go unvaccinated this flu season. Does your company address these obstacles while planning your on-site flu shot clinic? Let us know how in the comments below! Editor's note: This blog was originally published in September 2016 and has been updated for freshness, accuracy, and relevance.